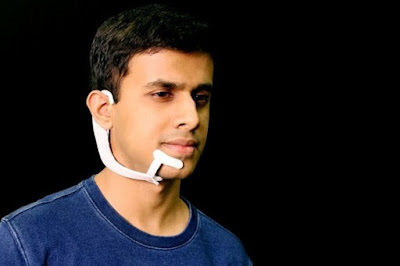 Arnav Kapur, a graduate student from the Massachusetts Institute of Technology (MIT), USA recently created a headset device called AlterEgo that is said to be able to heard the words without saying it. Then, how the headset device can read mind? Yes, this easy-to-use headset can hear our speech in the brain. So, this headset works by measuring small human-made neuromuscular signals, when saying the words in the head. These signals are not visible to the human eye. But, when electrodes are affixed at various points on the jaw, they are perfectly legible and understandable. As quoted from the Huffington Post page on Sunday, April 8, 2018, the software on the headset device captures the signals, then translates them in words, to be sent to a computer or other person. Arnav with his professors and other experts at MIT has conducted two types of tests. First, they try to control the TV streaming device, without saying a word through the mouth, but through the instructions in their minds. The second is to move the chess pieces on the computer game. They notify the movement through the headset on the computer, then the computer will respond, and send it back through the headset. During the test, the ability of this device to translate words is 92%. Not satisfied just get there, then the researchers will continue to develop this device. They want to create a faster and responsive system, so two people can have a conversation without making a sound, typing, or calling.